Do you ever wonder about what an egg is made up of? How it all creates a chick, or even what each part is actually for? Recently I did some in depth research to find the answers to these questions. I was astonished by the complexity of the egg that is so easily overlooked. When talking about the shell of an egg you might say its hard, protective, solid, but actually an average chicken egg has about 7,000 pores on its surface. These are so the chick can breathe on the inside on the egg. This is also how moisture and other essential vapors/gases (including oxygen) come in and out of the egg. This shell is made up of calcium. The Cuticula is inside the egg shell and keeps out bacteria and dust that would otherwise contaminate the inner egg. Underneath this shell are two membranes, the outer and inner shell membranes (this is what makes it slightly difficult to peel eggs at times). These membranes protect the eggs from bacteria & prevent necessary moisture from expelling from the egg. When the egg is first laid it is very warm. About 106 degrees Fahrenheit to be exact. Once it leaves the hen and cool to room temperature the egg shrinks inside the shell creating a vacuum effect that pulls air into the egg. This is similar to a bottle of water left in your car on a hot day then taking it into the cold house and the bottle shrinks like someone squeezed it. Due to this the air cell is formed in the egg on the large side of the egg. As the embryo grows the shells inner membrane surrounds & contains the Thick and Thin Albumen of the egg. This membrane helps protect against bacteria. The Albumen provides the liquid in which the embryo develops, and it also contains a large amount of protein for the necessary development of the chick. The Vitelline membrane is very thin until after fertilization. Then the membrane thickens to protect the Yolk and Germinal disc. In a fresh egg you can see the Chalaza (2 cords), which are made from twisted strands of fibers & protein. This is also what holds the yolk in the center of the egg. The more noticeable the Chalaza is, the fresher the egg is. Many people mistaken the yolk for the baby chick but actually the yolk is a form of protein for the chick as it develops. The yolk also contains all the fat in the egg. The Germinal disc is where the hen’s genetic material is found and where the chick develops. Once we started raising a lot of our own meat chickens, it quickly became clear that plucking was the most time-consuming part of the operation. Luckily, there are several ways to make your own mechanical plucker and expedite processing day. $20. The bad news is that you’re either going to spend a long time scrounging for used parts or spend about $600 buying the parts new. As a result, I think the Whiz-Bang Chicken Plucker is only appropriate for folks starting a pastured broiler business, plucking hundreds or thousands of chickens every year. The next most expensive option is the Markham Plucker, the plans for which are found in Mini-Farming: Self-Sufficiency on 1/4 Acre ($11.53 on Amazon.) A motor turns a belt that rotates a piece of PVC pipe covered with chicken plucker fingers. You hold the chicken against the fingers, rotating the bird as necessary to remove all of the feathers. I haven’t used or made a Markham Plucker, but my guesstimate is that the plucker could be built using new parts for less than $200. I’d be curious to hear a first hand account from someone who’s made and used a Markham Plucker — does it get the wing and tail feathers? How well does the machine pluck? that onto a drill. The price tag (assuming you already have a drill) is around $20. The plucker operates pretty much like the Markham Plucker and reports on its efficiency vary. Mark is currently experimenting with a washboard-style chicken plucker. 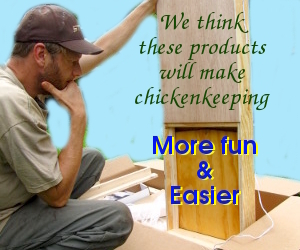 The idea is simple — he installed chicken plucker fingers in the sides and bottom of a U of plywood (cost — $20 to $30). You hand-pluck the difficult wing and tail feathers, then pull the bird through the plucker a few times, rotating it after each pass. I was astonished at the efficacy of version 1.0 (even though Mark thought it needed more work.) Sure, I had to pluck the feathers around the neck and between the legs after the plucker was done, but I estimate the washboard plucker saved me about 10 minutes per bird — and it doesn’t require electricity! I’ll keep you posted once Mark comes up with version 2.0. Do you have an even better way to pluck your chickens? Although it sounds esoteric, the feed conversion rate is at the heart of raising a sustainable chicken. Also known as the feed to meat ratio, this number is simply the pounds of feed given to a chicken divided by the weight of the cleaned carcass. chicken will not only take more money out of your pocket than buying one from the store would, your homegrown chicken will also have a larger environmental footprint. In my mind, that’s unsustainable. 2 : 1 — what the industry claims they get for factory farmed Cornish Cross. 3.5 : 1 — what you can expect to get from pastured Cornish Cross in optimum weather. 6.2 : 1 — Our Dark Cornish at 12 weeks last year. chickens can’t digest much grass, so what you’re really counting is how many bugs your birds found. It seems to take broilers more energy to find bugs than they get from eating those bugs, thus the lower feed conversion rate on pasture. Although these numbers seem very disheartening, I hope they don’t make you turn to supermarket chickens. As I’ll explain in a later post, I think that homesteaders can grow heritage chickens at nearly the same feed conversion rate that you’d get from Cornish Cross on pasture (and maybe even better) if we’re willing to think outside the box.